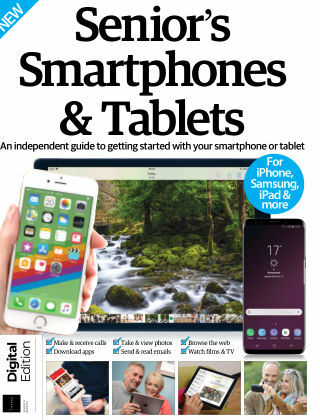 With Readly you can read Senior's Edition Smartphones & Tablets and thousands of other magazines on your tablet and smartphone. Get access to all with just one subscription. New releases and back issues – all included. Smartphones and tablets have come a long way in just a few short years. These compact devices allow you complete an incredible number of day-to-day tasks wherever you are, thanks to their portability and versatility. Your smartphone is not just a phone; it’s an all-round media player, a camera, a camcorder, an e-reader and a gateway to the internet that’s always in your pocket. Your tablet is also a games console, a word processor and a safe place for all your treasured photos and videos. Whether you have an iPhone, iPad or an Android smartphone or tablet you’ll find a user-friendly and dynamic interface coupled with recently updated operating systems. So now you have your hands on your brand new life-changing device, you can start to benefit from all it has to offer thanks to Senior’s Edition: Smartphones & Tablets. From surfing the web to downloading apps, this book will cover all you need to know.